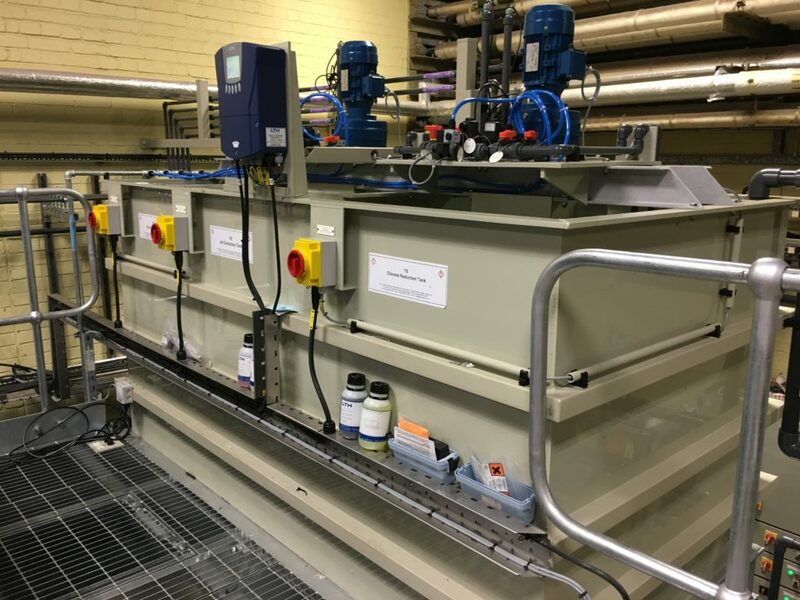 The H+E supplied a Treatment Plant to handle wastewater containing a mixture of highly concentrated acids. This included Hydrofluoric and Nitric acids, and also contains a range of soluble metals. Overall plant design and manufacture was to an unusually high standard because of the particularly highly-sensitive application. The target minimum design life was 40 years. It also included the supply of documentation to a very high standard. This involved neutralising the wastewater with calcium hydroxide to precipitate the fluoride as calcium fluoride. Neutralisation is done in two separate steps simply because the pH of the incoming wastewater is less than 1. Flocculation of the solids produced is the next step to allow their efficient separation from the wastewater in one of our Tube Settlers. 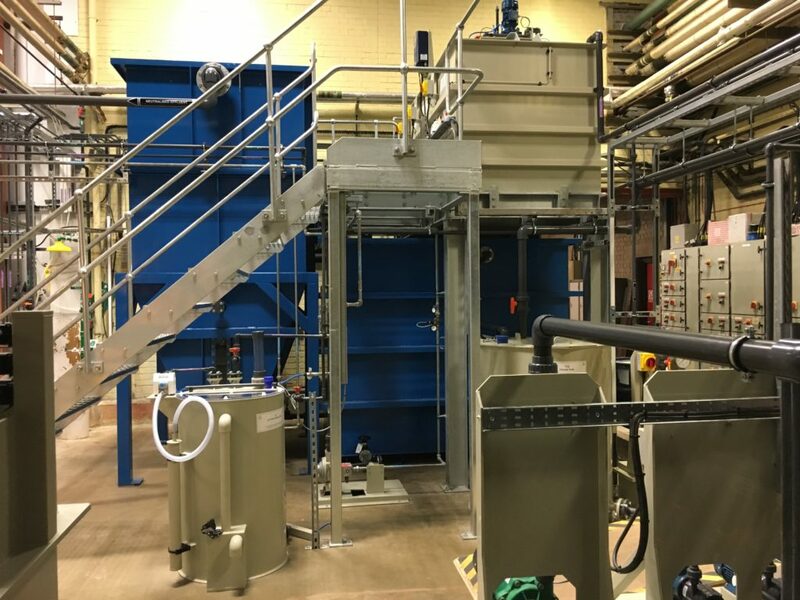 This highly efficient lamella clarifier design is a standard product. Literally hundreds of plants benefit from their installation. Following settlement, the clarified wastewater flows into a TOVEKO continuous gravity sand filter. This removes any final traces of fine solids. Sometimes the wastewater is too warm to discharge directly to sewer. It is therefore cooled when necessary. On-line instruments continuously monitor the quality of the treated wastewater. It then mixes with various other non-toxic wastewater streams and discharges to foul sewer. The plant also monitors the quality of the final, mixed wastewater stream before discharge to foul sewer. The sludge formed by the settling solids transfers automatically to a separate sludge holding tank. The sludge settles further in the quiescent conditions. A decanting system automatically removes excess water and recirculates it back into the plant for final treatment. A filter press then dewaters the thickened sludge. The solid “cake” produced is taken off-site for disposal. We included an unusually sophisticated plant control system. 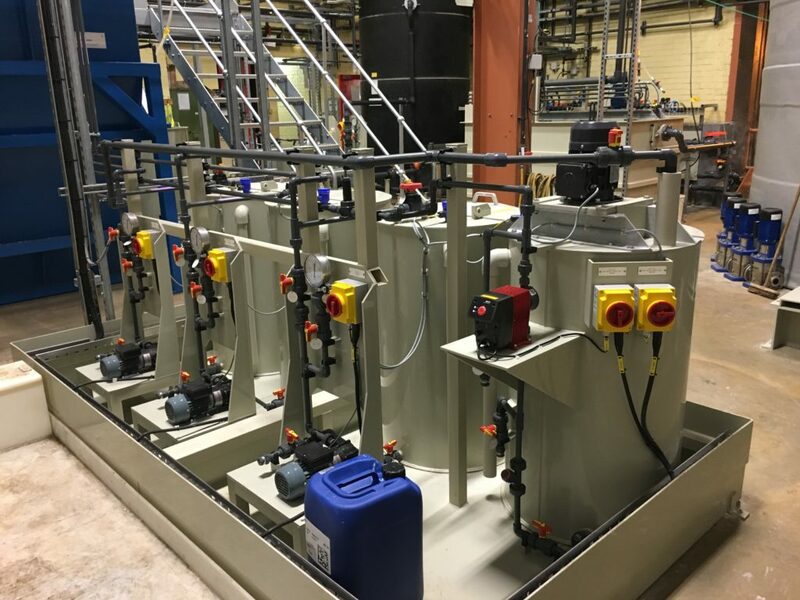 It features a far greater degree and depth of continuous control and monitoring than is normal for this type of wastewater in a more “standard” industrial environment. We both manufactured and pre-assembled the plant to a very high level. We then inspected and Factory Tested it thoroughly before delivering it to site. Pre-assembly has been an integral part of our culture for a substantial time now, mainly because it enables us to control the quality of what we deliver and also because testing in our factories is so much more efficient than doing so on site. You can find further information about H+E’s Tube Settlers and TOVEKO filters in the Downloads section.